The FAA is preparing an Environmental Assessment (EA) in accordance with FAA Order 1050.1F to document the potential environmental effects associated with the proposed optimization of aircraft routes and the supporting airspace management structure serving aircraft operating under instrument flight rules (IFR) while departing from or arriving to the Las Vegas area. Please use the navigation bar on the left to access important information on the EA, including the EA documents, the project schedule, and contact information for the Project. Additionally, flight procedures for the following airports are being developed and are included in the EA but do not meet the FAA Order 1050.1F criteria to be designated an EA Study Airport. The Project may involve changes in aircraft flight paths and altitudes in certain areas, but would not result in any ground disturbance or increase the number of aircraft operations at any of the above airports. 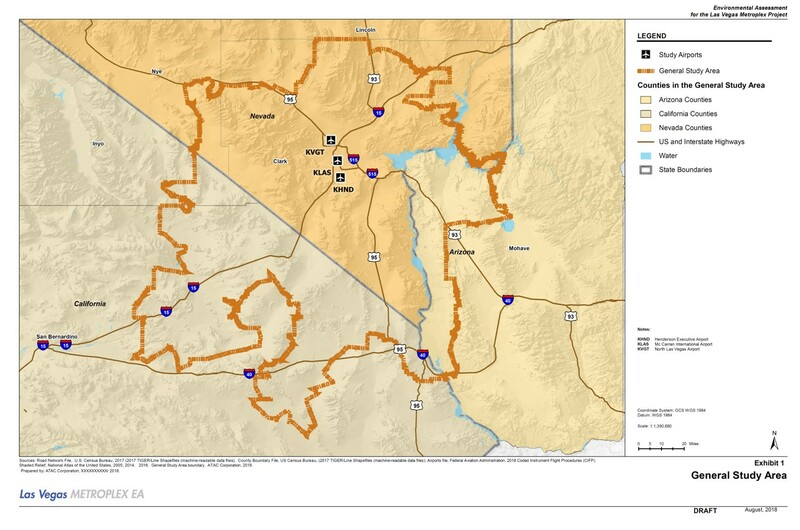 To evaluate the potential environmental impacts of the Las Vegas Metroplex project, the FAA has establishing the General Study Area, consisting of areas around the above airports. The General Study Area will be used to evaluate the potential environmental impacts resulting from changes in aircraft routing proposed to occur below 10,000 feet above ground level (AGL).